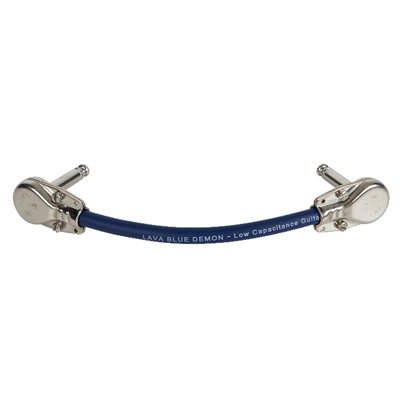 Lava Cable, LLC offers the widest range of patch cables in a good-better-best selection for use between guitar pedals and on guitar racks and systems of any company within the music industry. Each of these cables are made to highest standards possible using the best 4% silver solder, plugs and cable available in a controlled environment. Our low profile soldered mini plugs are the smallest in available and our Lava-Switchcraft 229 plug is the best pancake-style plug on the market. Our Mini Ultramafic and Mini ELC cables are used by many professional rack and pedal board builders for their superior signal transfer and tone improvement. Guitarist’s Steve Vai, Michael Anthony, Buck Dharma, Joe Bonamassa, Kenny Wayne Shepherd, along with many other pro pedal boards are wired with our Mini cables and plugs. All of our patch cables provide for better tone and more space on your pedal board and they come with a lifetime warranty. These world-class patch cables come in lengths from 3” to 26” with normal or opposite facing plug direction. They are no-comprise products proudly made in the USA by a Veteran-Owned company.